MizB at Should Be Reading is hosting the 2010 TBR Challenge. And I decided to join…today! At the very last minute…I like to keep things interesting! ** Pick 12 books – one for each month of the year – that you’ve been wanting to read (that have been on your “ToBe Read” list) for 6 months or longer, but haven’t gotten around to. * OPTIONAL: you can join the Yahoo! Group created for participants of the TBR Challenge, if you want to have a place to keep your list, or just to share with others about how you’re doing! By the end of the year you should’ve knocked 12 books off of your TBR list! (of course, if you’re anything like me, you’ll have added *at LEAST* 12 more to the ever-growing pile by then!). 12. The Girl With the Dragon Tattoo by Stieg Larsson (Done and reviewed! I thought I would share the books I got for the holidays with everyone. Thanks to The Story Siren for hosting this! I think I will do this once a month…if I get new books! I am trying not to buy many new ones this year – being unemployed means cutting where possible and since libraries exist, books are a great way to start! My husband went with a theme this year…books! It is a great book! I went through and I can only remember reading about 100 of the books, so going through it will be great! I think I may make a challenge that has to do with it…I know a lot of bloggers who would love this book! I know nothing about The Keys to the Kingdom series, so I am excited to read it! I also have been cooking a lot so I got some great cookbooks! Mastering the Art of French Cooking by Julia Child. We also got two Eat This…Not That books since we are trying to be healthier. I can’t wait to read all of my books! First of all – I hope everyone had a great Christmas and that everyone has a nice weekend! It’s 1964 and ten-year-old Felix is sure of a few things: the birds and the bees are puzzling, television is magical, and this is one Christmas he’ll never forget. LBJ and Lady Bird are in the White House, Meet the Beatles is on everyone’s turntable, and Felix Funicello (distant cousin of the iconic Annette!) is doing his best to navigate fifth grade—easier said than done when scary movies still give you nightmares and you bear a striking resemblance to a certain adorable cartoon boy. Back in his beloved fictional town of Three Rivers, Connecticut, with a new cast of endearing characters, Wally Lamb takes his readers straight into the halls of St. Aloysius Gonzaga Parochial School—where Mother Filomina’s word is law and goody-two-shoes Rosalie Twerski is sure to be minding everyone’s business. But grammar and arithmetic move to the back burner this holiday season with the sudden arrivals of substitute teacher Madame Frechette, straight from QuÉbec, and feisty Russian student Zhenya Kabakova. While Felix learns the meaning of French kissing, cultural misunderstanding, and tableaux vivants, Wishin’ and Hopin’ barrels toward one outrageous Christmas. From the Funicello family’s bus-station lunch counter to the elementary school playground (with an uproarious stop at the Pillsbury Bake-Off), Wishin’ and Hopin’ is a vivid slice of 1960s life, a wise and witty holiday tale that celebrates where we’ve been—and how far we’ve come. Every Christmas Eve I get a book from “book Santa” and this year it was this. I loved She’s Come Undone and love Lamb’s writing style, so I was VERY excited! This book is really cute! The characters are fun – from the brown-nosing brat to the possibly Communist new girl, everyone has a personality and a quirk. I was laughing out loud and getting looks from my family, but it was that funny. Lamb is a great storyteller – the characters really came to life in my mind and I felt like a fly on the wall in the classroom and could not wait to see what would happen next. Try to get this book soon! Helen Fremont was raised Roman Catholic in America, only to discover in adulthood that her parents were Jews who had survived the Holocaust. Delving into extraordinary secrets that held her family together in a bond of silence for more than forty years, she recounts with heartbreaking clarity and candor a remarkable tale of survival, as vivid as fiction but with the eloquence of truth. When Helen was small, her mother taught her the sign of the cross in six languages. Theirs was teh tender conspiracy of a little girl and her mother at bedtime, protected by a God who could respond in any language. What she didn’t understand was that she was being equipped with proof of her Catholicism, a hedge against persecution, real or imagined. It wasn’t until adulthood that she began to comprehend the terrible irony of her mother’s gesture. She knew that her father had spent six years in the Siberian Gulag, surviving nearly on will alone; that her mother’s elder sister, fearless and proud, had married an Italian Fascist whose title and connections helped them survive during the war. But their faith, their legacy as Jews, was kept hidden for decades. This book was picked for my book club that I found on meetup.com in December. I couldn’t make the meet because we had plans, but I still wanted to read the book. People in the group liked it and I try to read everything about the Holocaust and the experiences of the people affected, because I think it is a part of history we cannot forget. This is a book that above anything else will make you think. Her parents changed their identities multiple times to save themselves, and their future family.They sacrificed everything to hide that they were Jewish. Both Helen and her sister Lara noticed holes in their lives and their past, so they start to investigate and find out the truth. They let their parents know that they know and her mother is not happy about it at all. She thinks the past should just stay there. She is still afraid that people will come and take everything they have. Helen’s mother still does not give information freely, Lara and Helen have to pry it out slowly. The story of how they survived was different from anything else I have read, they were not in concentration camps, they were not hiding in a basement (for the most part). They were using their intelligence and education to save themselves. What shocked me the most was Zosia’s reaction to Helen and Lara digging in their past – she is furious. She kicks Helen out after reading her notebooks of information. Helen had told Zosia’s son and his wife, and Zosia acts like it is something to be ashamed of, even though it made her son understand things a lot more. Zosia also yells at Helen for being :obsessed with the Holocaust” which made me angry. What did she expect to happen when you have lied to your children for their entire lives? This has been a difficult review to write because it was a difficult book to digest. Her parents are such strong and hard-working people and they only did what they thought was right…but at the same time it is easy to get frustrated with them like Helen did, which may have been my problem. I didn’t LIKE feeling frustrated with them! They were good people. I guess from a literary perspective it is a positive thing that Helen kept her parents as they were, but at the same time I wish she had toned down her frustration because it made reading parts of the book aggravating. That said, it is still a good read and offers a new perspective. I think that the story of the children of survivors is also a very important one and they are people who help teach us what happened and how it can affect the rest of your life. I also am glad she told her family’s secret because I think being ashamed of what happened and hiding your heritage means that the idiots who deny that it happened and the Anti-Semites have won a little. There are a lot of people who are angry that she revealed her parent’s secrets to the world…but I am not going to judge her on that. Have you read or reviewed the book? If so, post about it in the links and I will add it to this! Summary (back cover copy): Shadow is a man with a past. But now he wants nothing more than to live a quiet life with his wife and stay out of trouble. Until he learns that hse’s been killed in a terrible accident. Flying home for the funeral, as a violent storm rocks the plane, a strange man in the seat next to him introduces himself. The man calls himself Mr. Wednesday, and he knows more about Shadow than in possible. He warns Shadow that a far bigger storm is coming. And from that moment on, nothing will ever be the same. Once i got to the second half of the book, I couldn’t put it down and finished it in a couple days. Once it picked up, it really picked up. Eventually i want to reread it to see if I could have figured out some of the twists earlier. Shadow is a great character – he wants a simple life, but instead lives an adventure and has to make some tough moral choices. 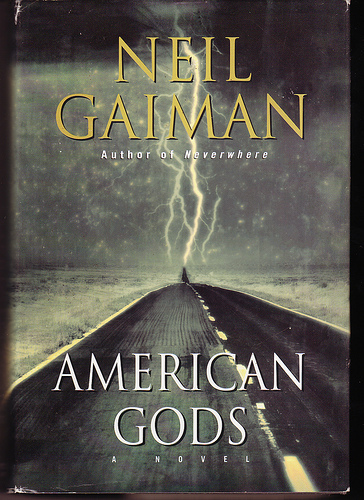 The book also has a lot of statements about society – the news “gods’ of America are the internet, TV, and laziness. The old gods are ignored and have mostly been forgotten. It takes a while to find out more about the main conflict between old and new, but the result is worth the wait! I like that the book does not include Greek gods that we all know about already. It has Norse, Native American, and other cultures, which I really liked since I did not know much about them. The book also has quite a bit of philosophies and things that make you think. My favorite was on page 508 in my copy, on the first page on Chapter 18, “Religions are, by definition, metaphors after all: God is a dream, a hope, a woman, and ironist, a father, a city, a house with many rooms, a watchmaker who left his prize chronometer in the desert — even, perhaps, against all evidence, a celestial being whose only interest is to make sure your football team, army, business, or marriage thrives, prospers, and triumphs over all oppositions”. What I love about this statement is that it can say so many things to so many different people. To me, it is a fairly true statement because to me, God really is hope and a dream that there is something out there that is watching out for us and is part of a better place when it is over. I also love the comment about football teams and armies. Thanking God for awards or a touchdown always seems silly to me – like in last night’s episode of Survivor two contestants were praying that they would win a reward challenge. I hope that, with all the problems in the world, that God isn’t busy worrying over whether or not they will get to go have a fun feast. My problem with the book was the beginning though. I know there had to be back story, but the wandering got annoying. It is worth it. For a little bit, Shadow is with Ibis and and Jacquel and that really shows what most of the book is like – strong characters and a fascinating plot. What do you think? If you have a review, let me know and I will link to it! Amanda from The Zen Leaf didn’t like it very much. I went and saw The Princess and the Frog with my husband Friday night. I was so excited about it, I (like everyone else) grew up with hand-drawn animation. I remember seeing Beauty and the Beast, The Lion King, Aladdin, Mulan, and the rest of the movies of the nineties as a kid, which is why we headed out opening night. The short review is go see it! It was a delightful story with fantastic music and beautiful animation! The villain and what he does is VERY creepy, like any good villain. The sidekicks bring humor and friendship to the story. Tiana’s friend, a rich southern belle, is kind, talkative and funny, she could have turned mean, but she loves her friend as much as she loves her fairy tales!I don’t want to give things away, so I won’t go into things any further. If you are unsure about this movie, go and see it when you get the chance! I hope Disney continues to go back to their drawing board! This is the BEST challenge I have ever seen. The goal is to do random acts of kindness everyday between Dec 12-24..the twelve days of Christmas. But I don’t think it should be just for Christmas…let it last the 8 days of Hannakuh if that is what you celebrate…then add a few more.Here is the video about the challenge. There are prizes available, but I don’t think I will post about what I do to try to win something…I just don’t want it to come off as bragging because that seems to take away the idea of doing something nice just to do something nice. I know it says random, but I have a few plans. 1. Take a bunch of my change to a bell ringer. 4. Call a friend that I know is having problems and offer to do something to help…even if it is just listening. This may be my favorite challenge. I challenge everyone else to participate also. If everyone was going around doing nice things for strangers or friends, this world would be a much better place! 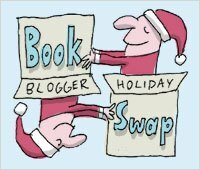 Book Blog Holiday Swap Goodies! I just got a great package from Amazon! My Secret Santee Robin sent me two new Tran-Siberian Orchestra CDs – The Christmas Attic and Beethoven’s Last Night. My collection is now complete! I love Love LOVE TSO….if I could see them in concert every year, I would in a second! I am loading them onto my computer as we speak and will listen to them at work tomorrow! Summary (from back cover copy): Beautiful present wrapped in ribbons, and multicolored lights glittering in the night through the falling snow. A Christmas Eve snowstorm transforms on small town into a romantic haven, the kind you only see in movies. Well, kinda. After all, a cold and wet hike from a stranded train through the middle of nowhere would not normally end with a delicious kiss with a charming stranger. And no one would think that a trip to Waffle House through four feet of snow would lead to love with an old friend. Or that the way back to true love begins with a painfully early morning shift at Starbucks. Thanks to three of today’s best-selling teen authors, the magic of the holidays shines on these hilarious and charming interconnected tales of love, romance, and breathtaking kisses. Review: This was a re-read for me. I got it for the holidays last year and read it once then. I felt like getting into the holiday spirit, so I thought I would read it again! I asked for it because I had just finished reading John Green’s other books and was trying to get my hands on everything he had done. Was I in for a surprise! I liked his story a lot, but my favorite was by this author I had only just heard of, Maureen Johnson (and now i have read almost all her books and love her also!). I didn’t know much about Lauren Myracle and was pleasantly surprised that I enjoyed her story so much too…especially the message of it. All three of these stories are connected and are connected very well. Most of the characters go to school together, but don’t know each other very well, which leads to some funny moments where characters are trying to figure out the name of the character the reader got to know so well in the story before. I am not surprised that these stories fit together so well because these writers sometimes get together and write, but I really enjoyed it. The individual stories were all done really well! I loved Jubilee and Stuart (and his family) – they were probably my favorite characters and their story just brought me warm and fuzzy feelings. Duke and Tobin and JP reminded me of some of my closest friends and brought back great holiday memories. And then there was Addie…oh self-absorbed Addie…while she was my least favorite main character, she gave the best reminder of how we should all act, not just around the holidays, but always. The stories were romantic and fun. If you are shopping for a young adult and want to introduce them to three fantastic YA authors, pick up this book! If you have written a review of this book let me know so I can link to you! Book Blogger Holiday Swap Gift Ready! I just wrapped and boxed up the gifts for the Book Blogger Holiday Swap. I have to say it was a lot of fun to go through the person’s Amazon list and find something that they would like. I actually was able to give them two things because they also wanted a book that I had and was looking to give to someone! I won’t say who it is because that takes out some of the fun, but I found a great new blog because of it! I will update this blog and my blog roll once they have received the gift so I can share it with you! I am sending it out tomorrow or Friday, depending on when I can get to the post office! i hope they like what I selected! If you participated, have you mailed it out? Did you find a great new blog or did you get someone who you already follow? I can’t wait to blog about what I get!